The more memorable music of the ambient genre invariably succeeds in taking the listener to places inward and outward (sometimes both). 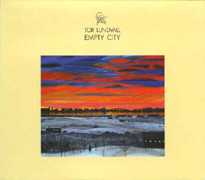 Empty City by Tor Lundvall is a study of the outside world. Taking inspiration from his paintings of city landscapes, Lundvall's aural canvas presents the city at night. Each of the twelve tracks serves as a waypoint along the journey through an obscured metropolis. Soft rhythms and sparse textures convey a phantasm of activity: a long wait at a train station, a metal shop working into the night, rainfall across the skyline, exploring the city late at night, finally falling asleep, and rising to a new day. Pads and washes form the backdrop. The foreground is populated by synth tones portraying elements of the night. Accurately described as ghost ambient, the sound is haunting yet warm and familiar. Indeed the paradox of Empty City's simple elegance is that dissonant sounds come together in a settling way; that dark ambience can be comforting.